Get A Muscle Mass Fix With Scientific Muscle Morphing! 3D Positions of Flexion (POF) is a simple concept based on real science that attacks all the layer of muscle growth with precision. Use the following clues and techniques to build amazing gains in less time! Muscle growth—and we're talking giant leaps in size—should be a lot easier for most bodybuilders. After all, hyperspeed hypertrophy has happened in the lab multiple times thanks to precise scientific applications. For example, there's the animal study that triggered a 300 percent increase in muscle mass in only one month with a specific type of overload (more on that coming up). Did you get that? A triple-size muscle gain in 30 days! 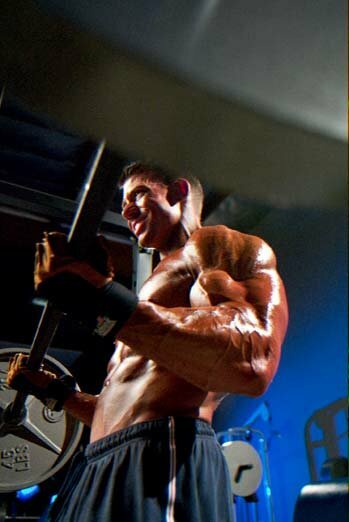 (Imagine the size of your biceps and triceps doubling or tripling in one month. Holy crap!) Then there are the Japanese scientists who got an 800 percent increase in size results over standard-training results using a specific method (that's eight times normal gains—more on that coming up too). Are you getting excited? You should be if you're into packing on more muscle as quickly as possible because these types of phenomenal size gains provide clues you can use to get huge! In fact, the first two photos below were taken only 10 weeks apart, when Jonathan gained 20 pounds of muscle (no steroids—more on how he did it coming up). The last photo is more recent after honing these specific mass-building techniques. Yes, it can be done—quickly! Yes, It Can Be Done Quickly! The mysteries of muscle growth seem to perplex every generation of bodybuilders—so much so, in fact, that most either quit out of frustration, overtrain themselves into oblivion—as in zero gains—or resort to dangerous drugs just to maintain a halfway decent amount of size. It doesn't have to be that way! It's not that difficult to pack on some major mass—if you know precisely what to do in the gym to mimic what scientists have done in the lab to create an extreme anabolic environment. Of course you have to apply some effort and sweat too—but not as much as some people think. Let's focus on exercise choice first so that you can go into the gym and pull the get-bigger trigger at every workout. That's where anabolic acceleration starts! We call it "3D" because there are three points of attack for each muscle, and each of those points, or positions, produces specific—and often dramatic—anabolic/hypertrophic stimuli, as dictated by scientific research. These exercises are, in most cases, the compound moves that engage a number of muscle groups at once—the big multi-joint exercises. Muscle teamwork means that you can overload the target muscle with heavy poundages (think squats or deadlifts). They not only overload the target, but also help jack up anabolic hormones like testosterone when you go heavy and push to exhaustion. The key to the anabolic ability of these mass boosters is muscle teamwork and max overload. Those allow you to optimize force production because of the heavy poundages you can use. Generating max force is what elicits the anabolic cascade and builds the fast-twitch muscle fibers—the fibers with the most potential for growth. If you don't generate enough force, you don't trigger a size increase in those fibers. It's that simple—however, extreme size is much more than just developing fast-twitch fibers, as you'll see in the next sections. In the opening we mentioned the animal study that got a 300 percent increase in muscle mass in only one month. The only form of muscular stress that was used in that experiment was progressive stretch overload. The scientists gradually increased the resistance on a bird's wing in an extreme stretch position over the course of a month of "workouts." In other words, the researchers are saying that a lot of the triple-size muscle gain was due to fiber multiplying rather than expanding. But do you really care how it happened? You just want it to happen to your muscles—now! And that means using progressive stretch overload at almost every workout. Mild freehand stretches or yoga-party routines won't do it; you have to have an overload component, which means weights (think heavy dumbbell flyes). Like midrange exercises, stretch-position moves also generate considerable force. Stretch-position exercises have also been linked to anabolic hormone release inside muscle tissue. Obviously they are very special hypertrophic stimulators. Even Arnold knew that instinctively. Remember how Arnold used to do his dumbbell flyes, emphasizing the bottom stretch and never coming up more than about halfway? He used heavy dumbbells and targeted the area of muscle elongation, driving through the pain of stretch overload. Could that be one reason his pecs grew to enormous proportions? And he brought his calves up with stretch overload too. He did a lot of donkey calf raises, emphasizing the bottom range of the stroke at the end of sets. His calves became monstrous! Was part of that due to hyperplasia? Hmm. 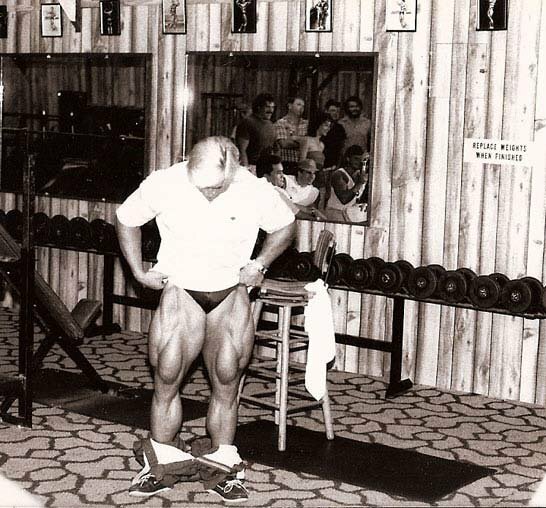 Tom Platz, a legendary bodybuilder who was known for his freaky quad development, used to do hack/sissy squats, and at exhaustion he would move to the bottom, stretch position and pulse for as many partials as he could stand. Could that extreme stretch stress/overload be a reason his quads moved into the freak-physique category? It's possible; and remember that this happened during a time when steroid use was minimal. Interesting!—if you're into building extreme muscle size, that is. Today you see Ronnie Coleman and Jay Cutler emphasizing muscle-stretch overload in their programs. Watch any of their DVD's and notice the attention to muscle elongation with heavy weights. 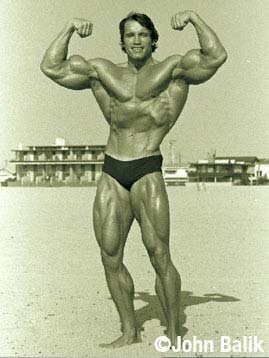 Coleman often does only the bottom stretch area of an exercise with a distinct explosion at muscle elongation, while Cutler double or triple hitches at the point of stretch on a lot of his exercises. Blocking blood flow to a muscle, or occlusion, has been shown to do tremendous things for muscle strength and size. It may be an adaptation effect created by choking off fuel and nutrient delivery. One study, which was reported on in the Journal of Strength Conditioning Research (15:362-366), applied it to subjects' forearms by placing a blood pressure cuff on their upper arms for two minutes. The cuff was then removed, and the subjects did wrist curls. What about muscle size? Japanese scientists have been experimenting with Kaatsu, or occlusion, techniques. They got a predictable, paltry 7 percent increase in quadriceps cross-sectional area in four months with standard training, but when they used occlusion, they got an 8 percent increase in cross-sectional area—in only two weeks! That's right, better results in about one-eighth the time—two weeks as opposed to 16 weeks. That's about an 800 percent increase in gains when blood flow was impeded. Wow! You can see why the biggest bodybuilders include continuous-tension sets in their routines—they force blood out of the muscle and create mass-and-strength-increasing occlusion. In other words, no rest for the target muscle during a set produces those blood-flow-blocking effects. Why does blocking blood flow produce such spectacular increases in muscle size and strength? Part of it may be due to the incredible rush of blood to the body part once blood flow resumes and the development of endurance components like capillary beds and cell mitochondria. Scientists have suggested that the body part bloodbath that occurs after occlusion can produce everything from upgraded release of heat shock proteins to alterations in muscle calcium metabolism (calcium contributes to contraction) to greater recruitment of fast-twitch muscle fibers. Interesting—and exciting—especially when you do the math: Let's see, a conservative 8 percent increase in quad size times 12 months—Holy cow! That'll double-size your thighs in a year! As we said, the key to occlusion in the gym is continuous tension—no target-muscle rest during a set—and resistance in the contracted position, where blood is "wrung" out of the muscle. That usually means single-joint isolation exercises (like leg extensions) for higher reps. These exercises are also notorious for igniting muscle burn, which in and of itself is anabolic—it's directly linked to growth hormone release, as verified by a study published in the Canadian Journal of Applied Physiology (22:244-255; 1997), a connection that may have something to do with higher blood lactic acid levels, which are partially responsible for muscle burn. That's a lot of information, but what should filter through to you is the three-pronged approach to scientific muscle building—midrange, stretch and contracted movements. There's a specific 3D biceps example coming up, but first let's talk about results. The most dramatic example of 3D POF's power occurred in the early '90s when it was first tested on Jonathan in the 10-Week Size Surge protocol. He used a basic routine for the first five weeks, mostly compound exercises with almost no stretch-position moves. Then for the second five weeks he shocked his muscles using full 3D POF routines for every body part, hitting each muscle with midrange-, stretch- and contracted-position work—but only one or two work sets of each. His result were astonishing, especially in that second five weeks when he introduced stretch-overload exercises. No, he didn't get a 300 percent increase in mass like in the bird study, but he did gain 20 pounds of muscle over the course of that 10-week experiment—and that's with no steroids and only basic supplementation. Jonathan Has Never Taken Growth-Enhancing Drugs. A good example of how and why this program worked so well is his two-phase biceps workout. During the first five-week phase, he only did barbell curls (midrange) and concentration curls (contracted), hitting arms once a week, on Wednesdays, one to two work sets of each (He trained his back, chest and delts twice a week, Monday and Friday, which provided residual arm work on those two other days, so he was getting some arm work three days a week). 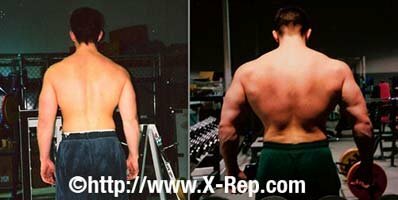 Remember, that first five weeks was the anabolic-primer stage, with few, if any, stretch-position exercises. For his second five-week phase, he moved to full 3D POF programs for every body part. So for biceps he did barbell curls, incline curls and concentration curls every four or five days. Note the addition of incline curls, the key stretch-overload exercise. He only did one to two work sets of each exercise—usually four or five total sets for biceps. Jonathan POF Bicep Exercises - Curls, Incline Curls, Concentration Curls. Click Here For A Printable Log Of The Full 3D POF Biceps Program. Jonathan's Arm Measurement Says Otherwise. 3D POF is a simple concept based on real science that attacks all the layer of muscle growth with precision. It's efficient anabolic acceleration. We've had reports of even better gains than Jonathan's from 3D POF users (see the quote at 3DMuscleBuilding.com). It works because its core concepts cover all the facets of muscle growth—from anabolic hormone release to max-force generation to stretch overload to continuous tension/occlusion/saturation. Try the above biceps routine, taking each work set to exhaustion, and you'll feel it working. Could you add 1 1/4 inches to your arms in a few weeks like Jonathan? Give it a shot. You've got nothing to lose, and loads of muscle to gain! Working together to help you build a better physical well being with sensible bodybuilding strategies.